She’s the queen behind the scenes, making your special occasions that much more extraordinary! Changtai Puguero Corporan, Assistant Housekeeping Manager for Divi Flamingo Beach Resort & Casino in Bonaire, is in charge of managing and coordinating the logistics of daily work, and ensuring that rooms are perfect for the arrival of our guests. But her true talent lies in the enchanting towel animals she creates for guests as an added treat. We recently chatted with Changtai to get a sneak peek into the inner-workings of a tropical, Caribbean resort. HOW LONG HAVE YOU WORKED FOR DIVI FLAMINGO BEACH RESORT? I have been with Divi Resorts for a year and a half, organizing daily housecleaning activities and prepping rooms for our guests’ arrivals. I also decorate rooms for special occasions like honeymoons, birthdays and special receptions. WHAT IS THE BEST PART OF WORKING FOR DIVI RESORTS? 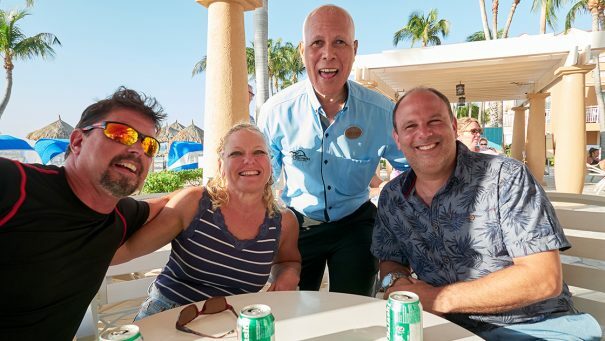 The best part of working for Divi Resorts is that we are a great big family, all working together as a team for a common goal–making guests happy. When a guest approaches me or one of our staff members to thank us for our service and special décor, that is the greatest satisfaction! TELL US ABOUT THE LASTING FRIENDSHIPS YOU’VE MADE AT DIVI FLAMINGO BEACH RESORT. I get along very well with everyone, but with the guests, it’s something special. We have many return guests, and I’ve had the opportunity to socialize and get to know them better thanks to the manager rum punch party we host once a week. It’s wonderful to hear about their families, and most importantly, their experiences on the island. Just knowing that I play a part in making their tropical getaway a dream come true is an absolute honor. 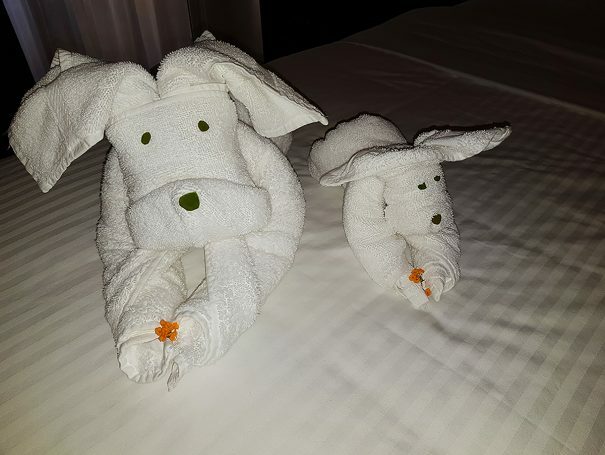 WHAT IS YOUR FAVORITE TOWEL ANIMAL TO CREATE FOR GUESTS? I love all of my towel animals, so it’s hard to choose just one! I just let my creativity flow, and my design is usually customized for the occasion. For honeymooners, I like to decorate the room with hearts, candles, and flowers. For other occasions, I tend to create whales, flamingos, turtles, monkeys, or puppies. My favorite activities when I am not working are swimming and snorkeling. Bonaire has some of the most amazing beaches, and beneath the water is a magical, mysterious paradise like no other. DO YOU HAVE ANY INSIDER TIPS FOR FIRST-TIME GUESTS? The advice I have for guests is to fully enjoy the island of Bonaire, Divi Dive Bonaire, and our many Resort amenities, like our restaurants, pools and beach. You’ll find everything we do here is done with much love and dedication. Meeting Brenda and Joseph Farmer, from Morningside, Maryland, you get the sense that they are devoted, not only to each other, but to their vacation time as well. Seven years ago, while walking along Palm Beach, they came across Divi Aruba Phoenix Beach Resort and took a tour. The couple purchased one week in August on the spot, and then for the next six years kept adding to their ownership. Last year, they decided to become Divi Vacation Club President’s Elite Members, owning Pure Points Prime, which gives them flexibility to enjoy both their fixed weeks or Pure Points, depending upon their travel plans. While they love their one-on-one time, the Farmers share the third week of their stay with friends and family, enjoying quality time together and discovering tourists spots around Aruba. 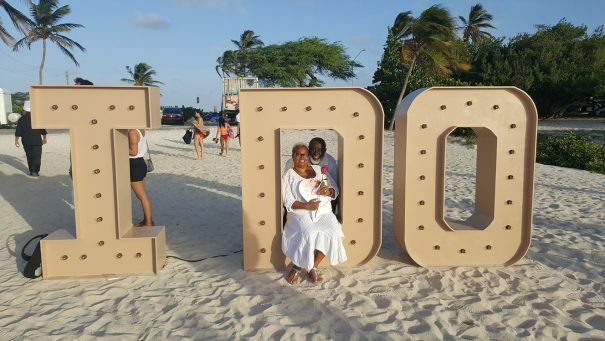 Last year, when their son got married, they gifted the lucky couple a honeymoon at Divi Aruba Phoenix using some of their Points. During their visit last August, the two celebrated their 35th wedding anniversary in a very special way. 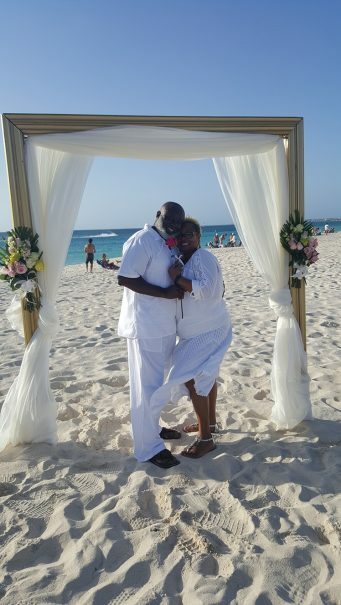 On August 8th, the island of Aruba invited lovebirds to “Renew Their I Do’s” as the sun set on Eagle Beach. Donning all-white attire, the Farmers joined in on the picturesque event. The night came to a close with a surprise pampering from the wonderful staff at Divi Aruba Phoenix, including a turndown of rose petals, champagne, candles and anniversary cake at one of the restaurants. Coming up next year is the Farmer’s big family reunion. They banked points from this year to use next year so that their two sons and in-laws could all be together. For Brenda and Joseph Farmer, being a part of the Club is the gift that keeps on giving. Phoenix Beach Resort, General Manager Gerrit Griffith is a true Divi veteran who has been a staple in our company for many years. 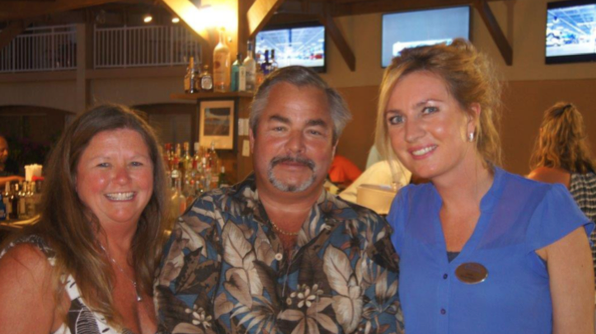 We recently got a chance to talk with Mr. Griffith about his experiences and why he loves his job as a Divi GM. You are Divi’s longest tenured General Manager – how long have you held this role? How does serving as GM of Divi Aruba Phoenix Beach Resort differ from managing the other Divi properties? What does the “Divi style” mean to you? What is the best part of your job as a Divi GM? How is the culture at Divi Phoenix affected by your team’s involvement in our Divi Cares program?